This entry was posted in production and sales and tagged press sales on August 8, 2011 by James Day. MINI continued on its path to a record year with solid growth across all continents in July. 20,153 vehicles were delivered last month, an increase of 10.5% over the 18,242 cars sold in July 2010. Year-to-date, MINI sales are up 27.1% on volume with 162,066 compared to 127,544 in the first seven months of 2010. This entry was posted in magazines news and tagged MC2 on August 8, 2011 by James Day. 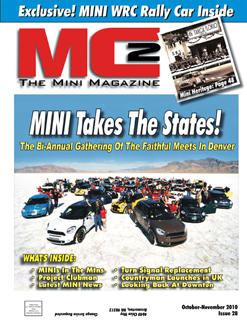 We announced in April that MC2 Magazine launched its online magazine. Now they have released issues 28 through 32 online. MC2 Magazine plans to add more issues in the near future.